Hello and Happy New Year! 2015 was a very busy gardening year for me as evidenced by fewer 2015 garden postings here at A Gardener’s Delight. I’ll start with a recap of last year’s garden and then move on to what I’m planning for Gardening in 2016. For the first time, I grew my own salad greens in pots. 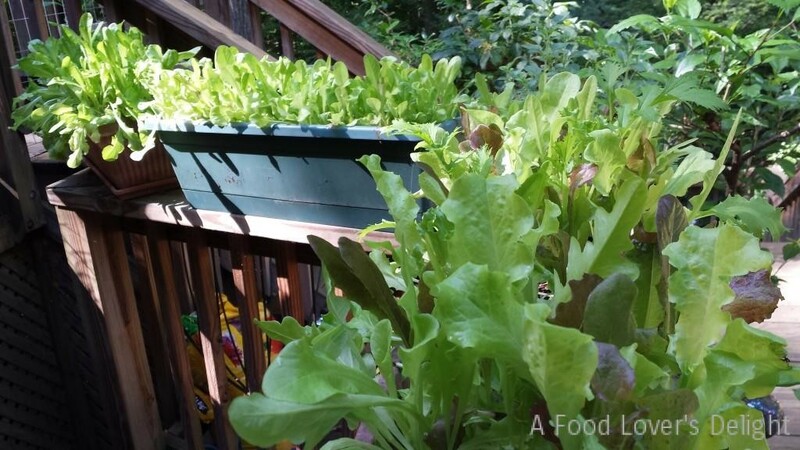 Check out my posting from my food site A Food Lover’s Delight: How to Grow Your Own Salad. Nothing’s tastier than picking fresh greens from your own garden. I chose pots because we have a lot of sun on our deck, but the planting beds are mostly shady in our fenced backyard. The pots were a great idea and kept most pests away. The salad greens were in window boxes on the top of the deck railings which kept them away from slugs. I grew the salad greens from seed: A spicy spring mix, a salad greens mixture, and also a couple kinds of arugula. I’ve noted that the “heirloom” varieties are far more finicky than the regular varieties. My heirloom arugula was stricken with cabbage moths and their caterpillars. I had to use an organic BT powder to get rid of the moths and caterpillars. Nothing bothered the spring mix. Maybe the pests were just busy eating the arugula. My tomato plant yields were mixed last year. I planted three different varieties, each in its own large pot with a tomato cage. 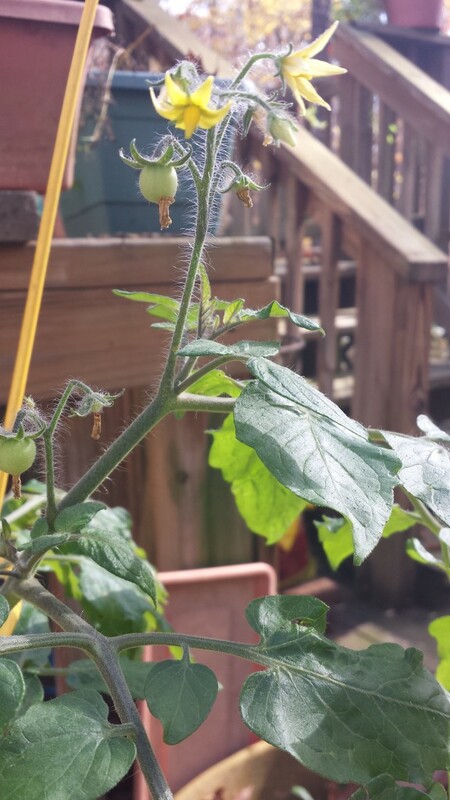 The heirloom tomato plant grew like crazy, reaching to the sun and stars, and yielded exactly ONE tomato. 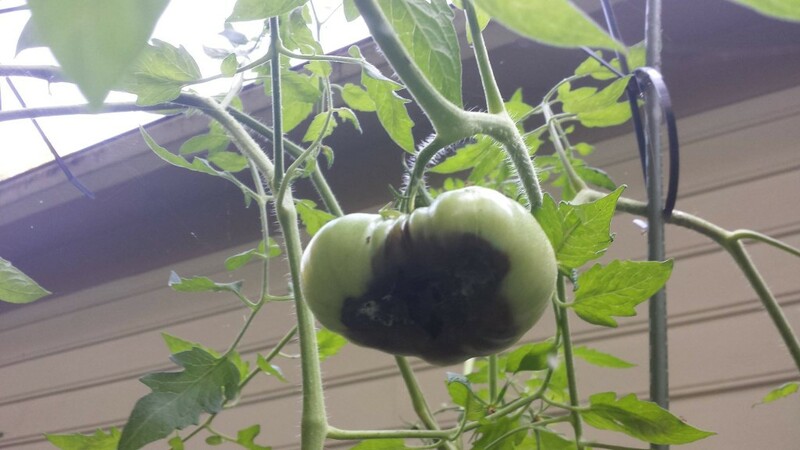 That one tomato, which took forever to grow, stayed green until late September and then developed blossom end rot. Unfortunately I had to discard it. 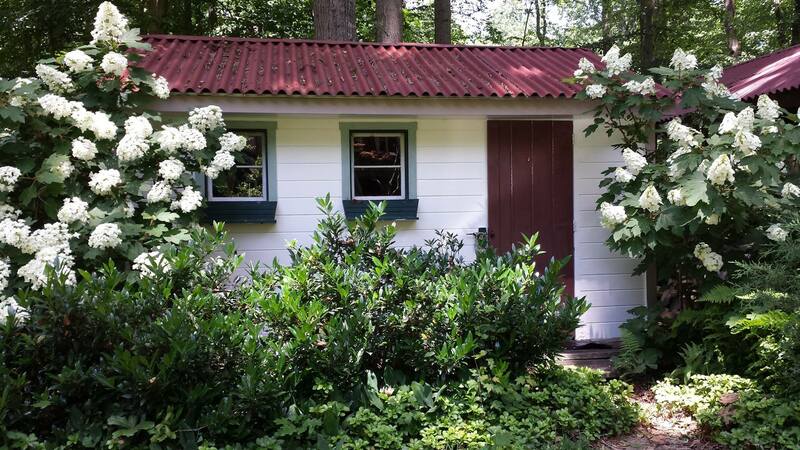 We had a lot of rain here in Virginia last Spring and Summer so over-soaked soil was a contributing factor as well as declining sunshine due to our stately surrounding oak trees. I also planted a Super Sweet 100 cherry tomato plant. I would definitely plant that one again. 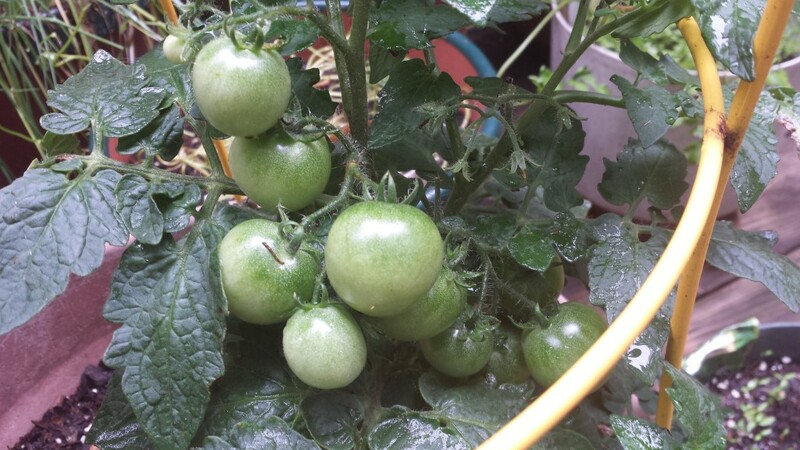 It was one small plant grew like crazy and yielded hundreds of cherry tomatoes. I purchased the first two tomato plants at my local Merrifield Garden Center. 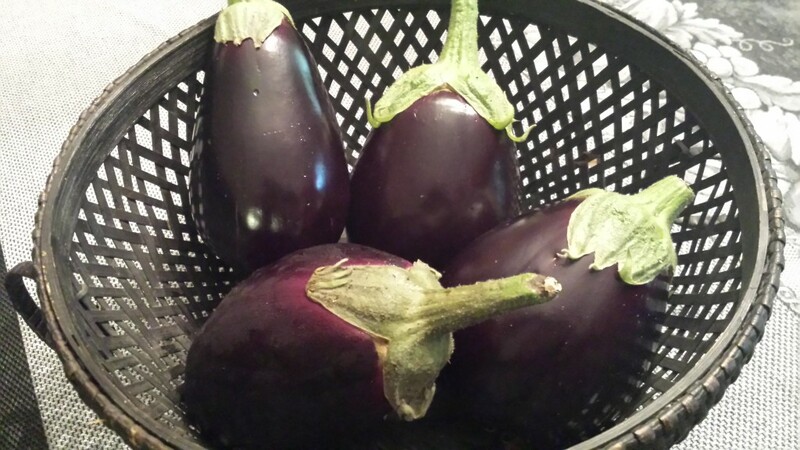 The third plant was grown locally and purchased at Whole Foods Market. It yielded maybe 40 tomatoes that were bigger than cherry tomatoes but smaller than regular tomatoes. 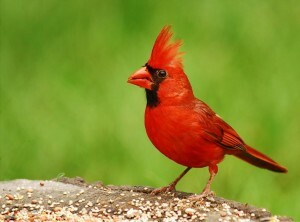 Sort of the “teenager” of the tomato group. My Super Sweet 100 cherry tomato plant went wild this year! 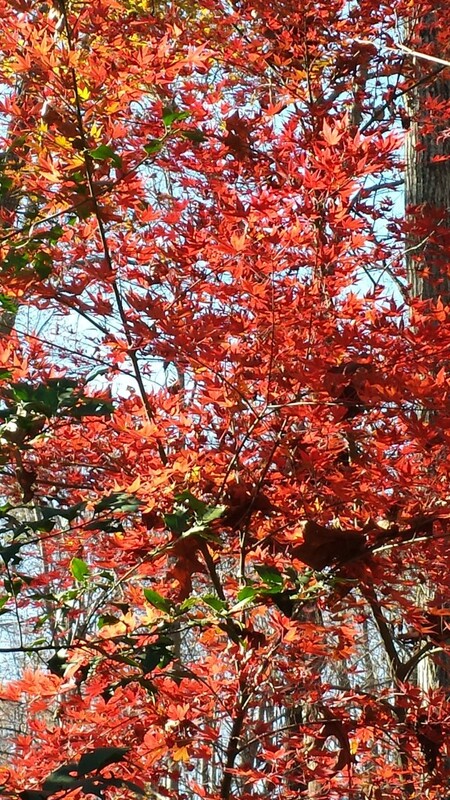 It was still blooming into mid-October. My potted herb garden grew nicely this year — mostly. I changed the soil in my very old thyme plants’ pot and it rewarded me by coming back very nicely. My chives come back reliably year after year. My rosemary plant has been happy for years and is now sitting inside the sunny kitchen window for the winter. My old potted sage plant was stricken with slugs due to all the rain we received. I’m sad to say that the old sage plant died off. I planted a second sage plant and it was also attacked by slugs. One parsley plant which has hung on for several years was also stricken by slugs. Each morning, I spent at least 10 minutes picking slugs off the plants. I hate to use slug bait around my herbs so I was using saucers of beer. Not exactly worthwhile since the slugs would first feast on the herbs and then stop over for a beer chaser where they would drown in happiness. I also used a smear of Vaseline the whole way around the outside of each pot’s middle, but that didn’t seem to guard against the slugs either. My potted herb and salad garden! My basil did better this year. Last year, it was struck with the “basil blight.” This year, the blight didn’t happen. I love fresh basil and just before our first frost, I harvested all of my basil and arugula and made basil and arugula pesto for the freezer. Something else I’ve tried, which turns out great, is Spring Mix Pesto. Ever buy a giant container of spring mix at the grocery store, only to have it start to wilt quickly or decline due to too much moisture? Try my Spring Mix Pesto recipe and you’ll never throw out your spring mix again. What to do with all that Spring Mix? 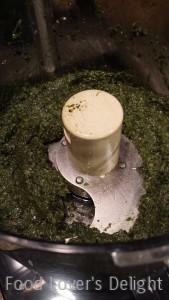 Make Spring Mix Pesto! I tried two types of oregano this year — Italian and Greek. Both have their own distinct flavors and are great for drying for future use. Two types of mint overwintered from last year: spearmint and pineapple mint. Both grew splendidly this past summer. My tarragon didn’t survive. My potted chives, oregano, mint, and parsley are all growing happily inside my screened porch for the winter. They get a few hours of sun and will hopefully overwinter nicely. I bring them inside because they are in terra cotta or ceramic pots and I don’t want the pots to crack in the weather. I left some potted chives outside on the deck along with lavender and another parsley plant. They are in plastic pots which don’t usually crack over the winter. Any herbs that I’ve cut and I can’t use are dried and stored in jars for future use. 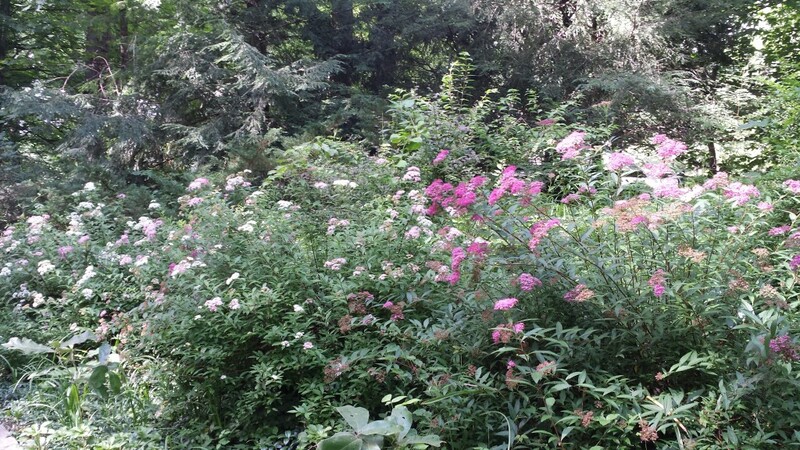 My neighbor has a large property with an enviable vegetable and herb garden that is fenced to protect it from deer. She gets full sun which allows her to grow a lot more produce than I can. We traded herbs and veggies all summer. Her rosemary plants are huge and she’s growing a very old tarragon plant that has some of the best tarragon that I’ve ever tasted. I’m lucky that she shares with me. Lots of flowers in my garden this year. 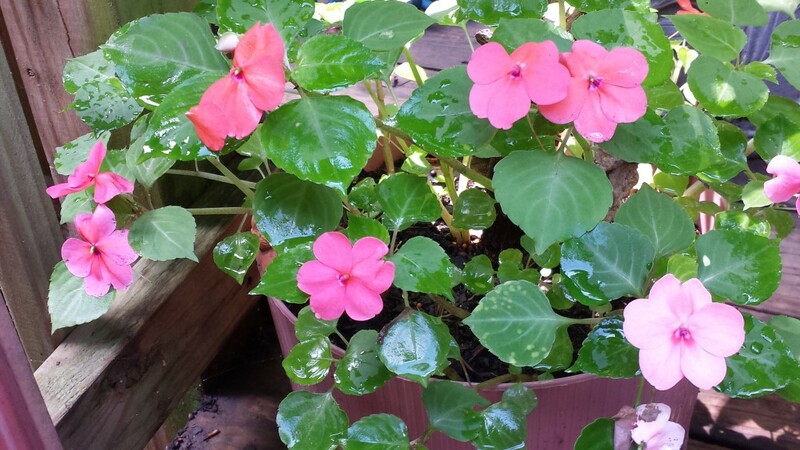 Our abundant rainfall caused problems with potted plants yet the ones in the ground produced loads of flowers. 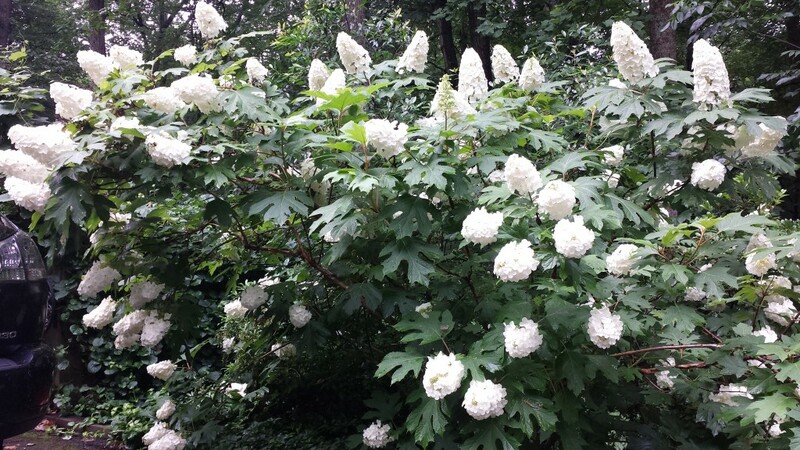 My peonies went gangbusters and the hydrangeas did not disappoint either. And my old annual impatiens, the ones not affected by the impatiens blight, lived long and happy lives and are still going in my basement for the winter! 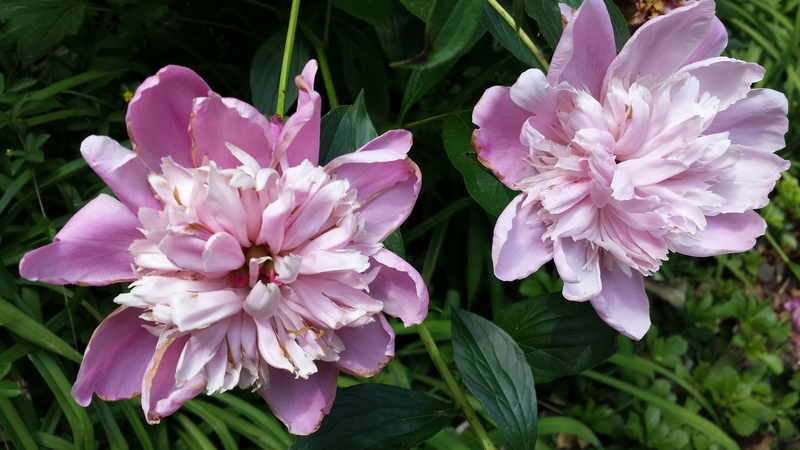 Here are a few photos of the gorgeous flowering plants in my garden last spring and summer. 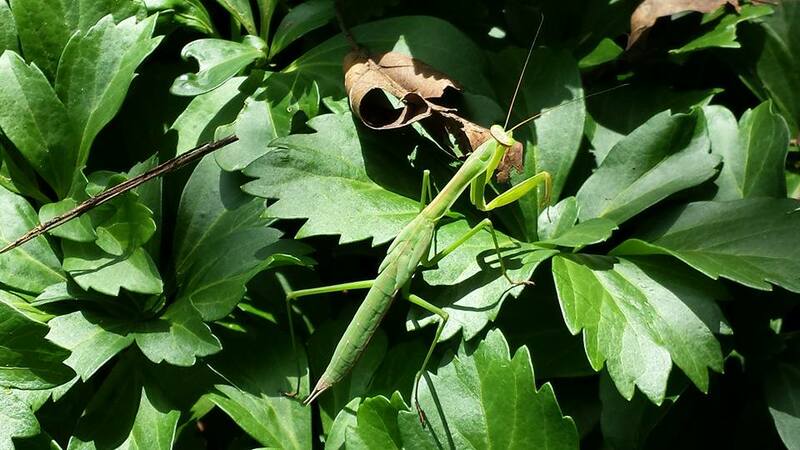 Some cute critters graced my garden this year. 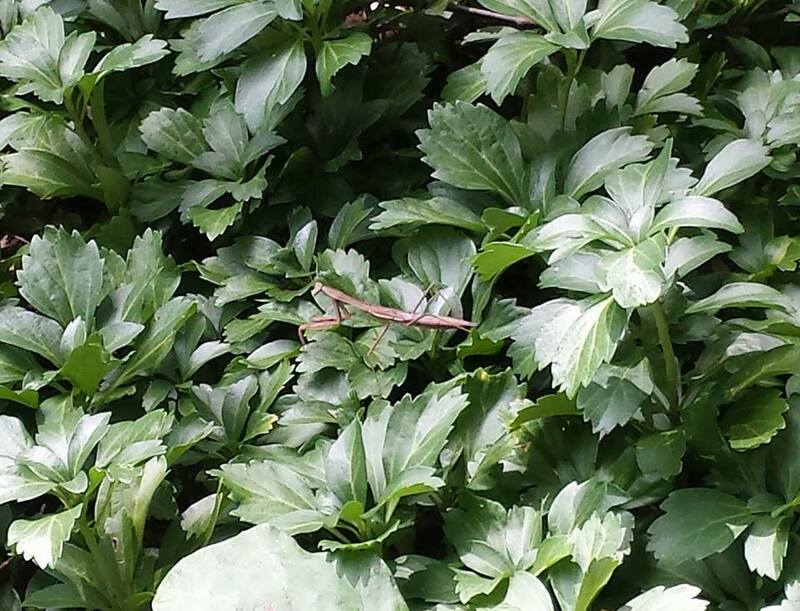 Quite a number of praying mantises stood guard in my pachysandra beds. 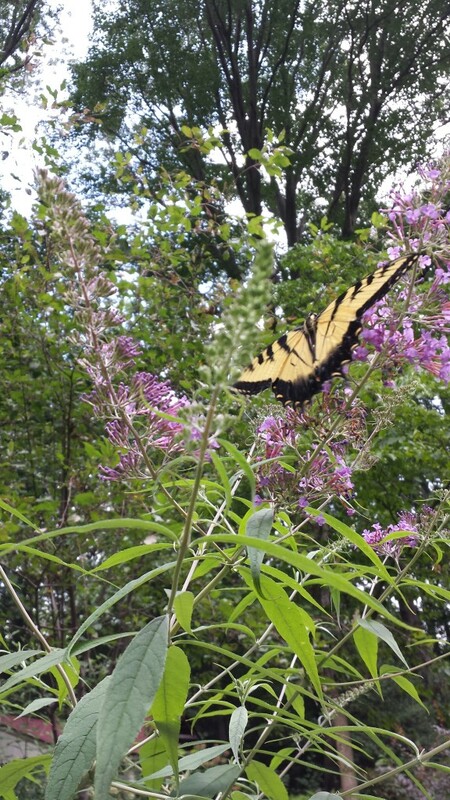 Butterflies fluttered around my butterfly bushes. 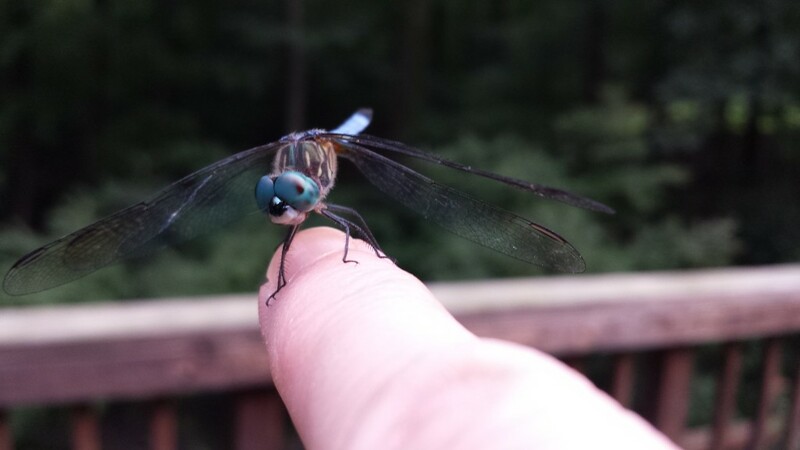 A couple of descendants from my Old Blue Eyes dragonfly a few years ago became friendly and even liked to land on my finger. They have such cute personalities! 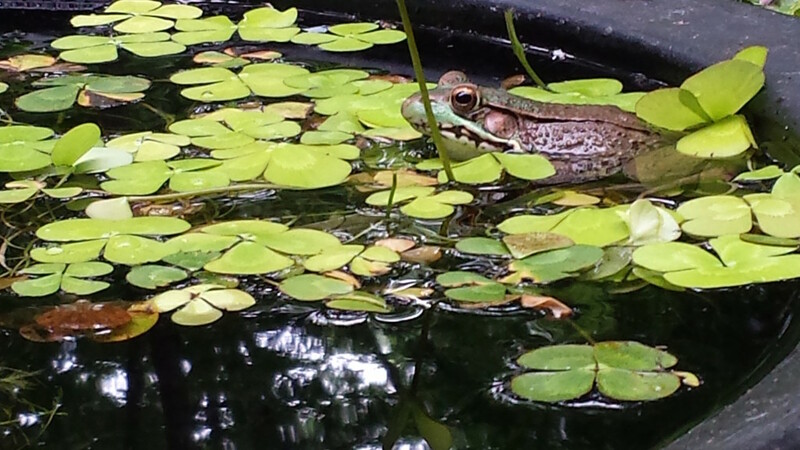 My friends began to call me “The Dragonfly Whisperer.” And we had fewer adult frogs this year at the ponds. Not sure why that happened as we had loads of tadpoles last Spring and Summer. 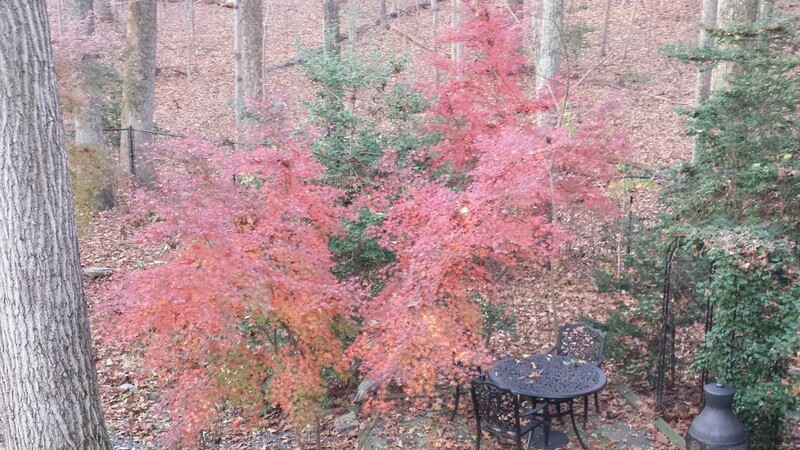 Late Fall and early Winter were fairly mild. We had a few weeks of 70 degree temperatures throughout November and December 2015. Eventually it cooled down, but was in the 70s again on Christmas Day. On my Christmas wish list this past year was The New Southern Living Garden Book: The Ultimate Guide to Gardening to add to my 150+ gardening book collection. Santa didn’t bring it to me for Christmas, so I bought it for myself. I look forward to browsing through the pages. So far, the book appears to have a lot of new plants in the plant dictionary as well as some new ideas on garden design. While Gardening in 2016, I will definitely plant salad greens in pots again. I’ll try the Super Sweet 100 cherry tomatoes, too. 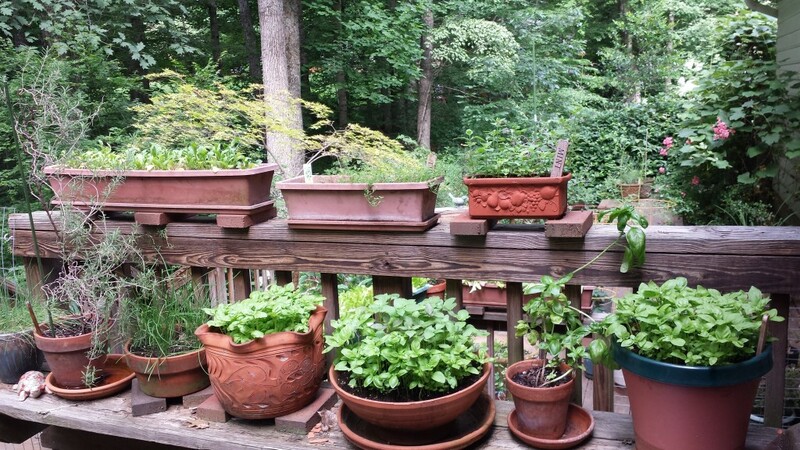 And of course, my potted herb garden is a mainstay on my deck. I’d like to clear out some of the little saplings that pop up in my pachysandra beds. Our oaks produced thousands of acorns this year which highly pleased the squirrels and deer alike. I’m hoping that all of those acorns don’t sprout because that will mean pulling them up out of my planting beds. 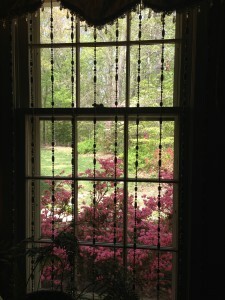 In doing my garden planning for this year, I’d love to have a fenced garden area like my neighbor’s. We do have an area that would suffice except it’s currently planted with some native dogwoods (which I would leave in place) and some pachysandra ground cover (which I could move). 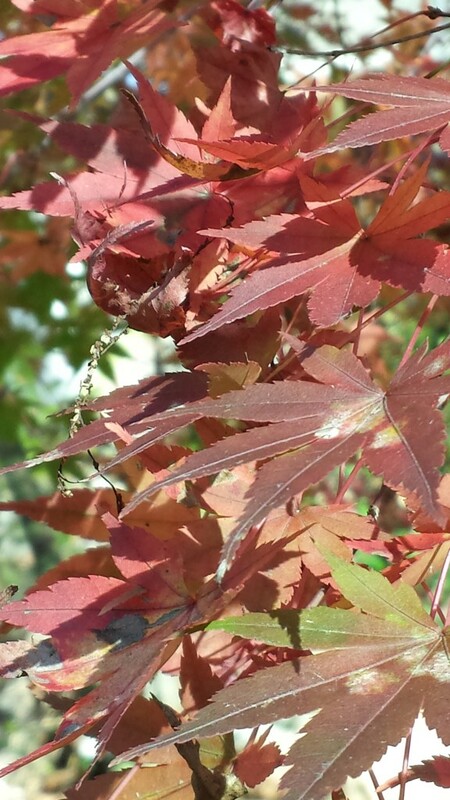 If you are starting your garden planning for this year, please check out my garden planning posting: It’s Time to Start This Year’s Garden Planning! What are your gardening plans for 2016? Leave a comment and let us know what you’ll be doing in your garden.